Brazilian food is a mouth watering mixture of spices and ingredients brought into Brazil by many different cultures over the years. Brazilian food recipes include elements from a number of different cultures, including Italian, Spanish and oriental to create an amazing blend that has a taste all of its own. Feijoada is widely considered the national meal, and is a prime example of Brazilian food at its best. A thick black bean stew with rice and pork meats, the recipe is a combination of European, African and Portuguese influences. This combination of savory flavors with the beans and the meats mixed with the sweetness of fruits, makes it an experience that is sure to stimulate your taste buds in amazing ways. 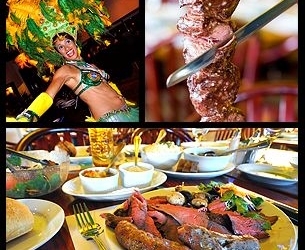 It is worth noting that a vast variety of ingredients influence different traditional Brazilian food recipes depending on the region of Brazil that it originated from. Different places will use different ingredients based upon what food sources are more prominent in the area. For example, the south of Brazil is better know for its rich barbecued meats, whereas the central region of the country has sweeter foods made with fruits such as mango, papaya and guava. Take the time to try the foods from the various different regions to experience the full spectrum of cuisine the the country has on offer. Just as with their foods Brazilian drinks are just as wonderfully varied. A number of different fruit drinks hale from Brazil, where they make wonderful use of fruits and nuts to craft some truly unique and mouth watering concoctions. Some of the best examples include Caipirinha, easily Brazil’s most famous drink, made from a blend of lime juices, sugar and cachaca it can either be made as a light and refreshing beverage or a drink with a bit of a kick to it. It’s not just alcoholic drinks that Brazil is well known for however, Guaraná Antartica is the countries most popular soft drink, with a very distinct apple and berry flavor The drink is so popular in Brazil that it is the official sponsor for the Brazilian football team, beating Coca-Cola to the top spot. Brazil is an amazingly varied country that can offer some truly unique and wonderful foods and drinks. Explore the products of the various regions of the country and get a taste of something wonderful.